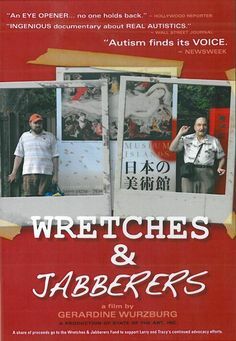 During the filming of Wretches and Jabberers, we set out on a global quest to change attitudes about disability, autism and intelligence. Since the film’s theatrical premiere in 2011, our film has been shown in across the United States and around the world. We have travelled and spoken to a variety of groups at colleges and universities, schools, conferences and communities. It has been a great experience to exchange ideas with these diverse groups. The result of our work has been an increasing shift in attitudes around the acceptance and inclusion of people with disabilities, autism, and particularly those who do not communicate with speech. It is our plan to continue this work and we welcome more opportunities to share our film and experiences as advocates for social change. Through advocacy and education, we seek to change attitudes about disability and to support the rights of people who are not able to speak. Our goal is for all individuals to be able to live and learn in their own schools and communities, and have lifelong access to a meaningful way to communicate. We envision a future where people with disabilities have a voice in the direction of their lives, have their talents and abilities recognized, and have access to meaningful education, work, and involvement in their communities.